Memories are tied to our senses. When we hear those opening chords of a song, smell fresh-cut grass, or eat a slice of home-baked pie we’re instantly transported to a moment in our past that we’ve attached to that sound, smell, or taste. Usually these memories are good and we want to remain there indefinitely, but sometimes they’re moments we wish we could use a Magic Eraser to permanently scrub from our mind. Our current economic climate has people across the globe searching for those portals that will send them to a happy place, even if it’s just for a few, brief moments of escape. Last week, I was able to provide that service to several friends. The members of my Thursday night poetry group have graciously offered to be taste-testers for many of the recipes from the box. Like me, most of them possess a strong sweet tooth and have been excited about the ratio of dessert-type recipes the box contains. Last week, however, we opted to take a break from the sweets and instead take a taste from the bread category: Maple Syrup Muffins. I’m glad we did. Upon first bite, all of us sat back, inhaled, and began recalling memories. It’s amazing the effect food can have on our minds and the journeys it can take us on. For me, that bite reminded me of my great-grandmother. It seems that whenever we get together with my mom’s family, someone at some point brings up my great-grandmother’s cooking; specifically her biscuits. She put so much love and care into her cooking that it oozed out with every bite. Every time my mom or grandmother mentions those flaky, buttery biscuits my mouth waters. I’m learning a lot from this little box and one of the biggest lessons has been the difference between “made from scratch” and “store-bought or processed” foods. Most of the muffins I’ve made over the years have been prepared by opening a box, dumping it into a bowl, mixing it with water (sometimes oil and maybe an egg), stirring the batter, and pouring it into a muffin tin. The Maple Syrup Muffins really aren’t that much more difficult to make and the difference in taste is worth the few extra steps. 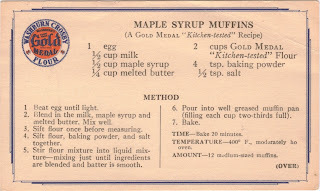 The recipe calls for ½ a cup of maple syrup (real maple syrup, not the “fake” stuff) and I expected an overwhelming syrup taste. Instead, they have just a hint of sweetness and the flavor seems to twirl on your tongue before sliding down your throat. 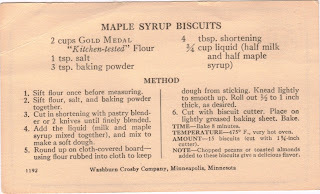 My great-grandmother’s biscuits had a similar effect, giving you a moment of real butter exhilaration before you swallow and dive in for another bite. Times have changed and people’s schedules don’t allow them to make all their meals and snacks from scratch. We reach for the quickest thing we can find, throw it in the microwave and eat it in the car on the way to work, our next appointment, or a child’s soccer game. Maybe that’s why when we taste something made from scratch it halts us in our tracks and takes us back to those memories of loved ones or special occasions. I haven’t thought about my great-grandmother in a long time, but that one bite of muffin flooded my mind with visions of her house in Florida, the black glasses she used to wear, and her huge orange cat named Morris that I carried around the every time I visited (he was a very tolerant cat). So thank you Mike for suggesting a detour from our usual path through the Found Recipe Box. I learned that “made from scratch” isn’t always time consuming and had the pleasure of revisiting memories of someone I love and miss very much. I hope everyone in the group had a similar experience. Its true that we have less time, even though we have more conveniences. It's really sad.